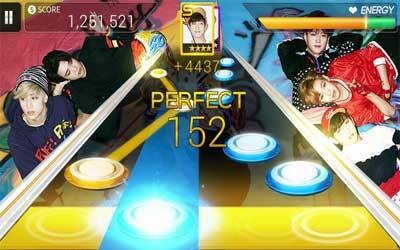 If you enjoy music-based game, SuperStar JYPNATION APK 1.0.4 might interest you. This game contains many artists and songs from Korea. For K-POP fans, this game definitely should be on their smartphone. After installation, you should select song then hit coloured-mark. On top screen, you will see energy bar in yellow and need to turn to green to pass one stage. Several musicians and artists in this game are 2PM, 2AM, Wonder Girls, J Y Park, Miss A, etc. Song genres are varying such as dance and pop. You will recognize the songs immediately because they are very popular. Some people think music-based genre is very static and not challenging. It might be a little bit because player does not have to move at complicated mode to pass the level. However, song in the game is something that very challenging. You think can finish at ease, but in fact it takes time to accomplish one song. In this game, your score is displayed to show the achievement. After finishing one song, you will get the card and record. More than six hundreds cards are available to be collected. The function of the card is to improve abilities. When you are able to obtain many cards, change them to get new ability. Record on superstar JYPNATION consists of player high score, weekly rating, and global ranking. You can play this game in three modes. There are easy, medium, and hard. Each of them has different score and star card if you succeed to overcome one song. Players are divided into some classes based on skill and score. You can challenge others in the same tier to get more points. With stunning graphic and clean sound, this game is very tempting. You can use headphone to listen attractive song individually or external speaker to enjoy more songs. Therefore, superstar JYPNATION for android hardly makes your face off from screen. Enhance your Star Cards to Power Up and Upgrade them for more points!